The journey towards vibrant and competitive cities along the HSR corridor. The KL-SG HSR is an impetus towards turbo-charging socio-economic development in Kuala Lumpur and the cities along the HSR corridor. The KL-SG HSR alignment will allow cities along the corridor to grow to exploit economies of agglomeration by increasing mobility and accessibility of the cities. In an unconstrained scenario with early socio-economic development, the estimated impact could reach up to RM 650 billion in GNI with 442,000 jobs created in 2069 if the coverage area incorporated comprehensive master planning of the surrounding areas of the stations, including transit-oriented development and hub zones (within 5-km radius of HSR stations). 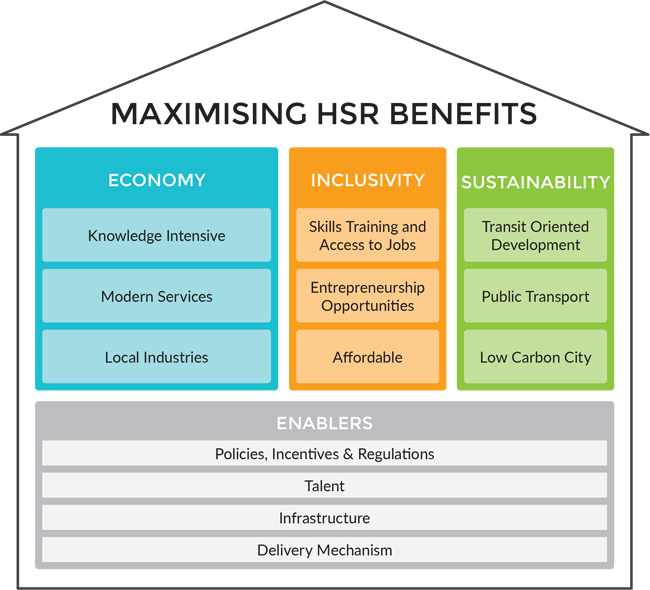 The presence of a HSR has proven to unlock employment opportunities in other countries. This can be seen through the development of the biotechnology and information and communications technology (ICT) industries in Shin-Yokohama, Japan. Combined with other enabling components in the city such as improved connectivity through public transport, Shin-Yokohama saw an increase of 147% in the population and approximately 700,000 jobs created from 1966 to 2006. Similarly, Lille in France experienced a 10% increase in job numbers after the HSR started operations. In line with this, MyHSR Corp worked with several key federal, state and local authorities since 2016 to develop the Socio-economic Development Programme (SEDP) for inclusive and sustainable growth along the KL-SG HSR corridor. A robust socio-economic development plan complemented by effective execution will help ensure that the cities along the HSR corridor are able to realise the economic and social impact from the HSR, especially for the benefit of local communities. The three SEDP core components - Economy, Inclusivity, and Sustainability - will help ensure that cities along the KL-SG HSR corridor are able to realise the economic and social impact from the HSR project. Set up appropriate delivery mechanisms to ensure effective implementation at federal, state and local levels, including private sector participation where relevant. The completion of the SEDP marks only the beginning of an exciting journey towards spurring growth of the seven cities along the HSR corridor. The delivery of implementation activities, timelines of proposed action steps and catalytic projects will be planned together with relevant stakeholders to ensure full ownership and effective execution. This will be achieved through two platforms: The Economic Acceleration Programme (EAP) and the Cities Transformation Programme (CTP). In an effort to ensure that cities along the HSR corridor are inclusive and sustainable, each city must leverage on its strengths for economic growth. Under the EAP, seven growth areas have been prioritised based on current strengths and future potential across the HSR corridor. The EAP will monitor, track and facilitate the delivery of the Economy component of the SEDP alongside the local stakeholders. The CTP focuses on the delivery of the SEDP’s Inclusivity and Sustainability components for the rejuvenation of modern cities. A multi-stakeholder approach involving state governments, local authorities and the private sector is required to rollout targeted programmes to create a vibrant, liveable and competitive environment. National rail - connects to Gatwick airport and 10 cities in the UK e.g., Cambridge, Edinburgh and etc. 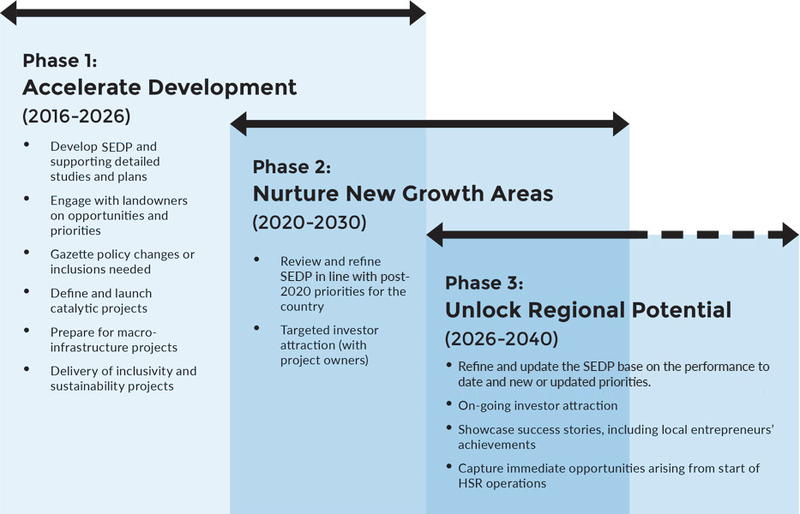 The SEDP charts a path for the growth and development of cities that are modern and holistic. Improved connectivity through the HSR will play an integral part in moving the economy up the value chain. Ultimately, the SEDP will help to deliver a brighter future for Malaysian cities with sustainable growth, prosperity and a new lifestyle of enhanced mobility that will continue to bring Malaysia to greater heights.